Warm spring weather is finally here so it’s time to get out and enjoy all the beauty and fun that MontCo has to offer in its many parks. Load up the kids, bring your bikes and trikes, pack a lunch and spend a day at one these MontCo park favorites. This 70-acre park has lots to offer recreation enthusiasts of all ages, but kids will love the amazing playground. The two-story castle-like climbing towers have twin slides for a quick exit to the bottom. Plenty of other climbing and swinging equipment too. The playground also features separate sections for varying ages and is completely fenced in for children’s safety. Benches, rest rooms and a water fountain are also available. The park also has a 1.1-mile paved walking/running track with 12 fitness stations, 2 pavilions, several ball fields, 2 sand volleyball courts and 2 basketball courts. This community playground features a large wooden climbing structure built under a grove of tall trees. It has turrets, swinging bridges, balance beams, slides and educational activities throughout the structure. Picnic tables and benches are scattered throughout the playground. The complex also features 2 courts for basketball, 5 tennis courts, 4 pickle ball courts and 2 ½ mile walking trails. Nor-Gwyn Pool is located here as well and is open to the public. Registration and fees apply, but residency in the township is not required. This park is a great place for walking on the one mile track that winds through fields and a pine tree forest. Pavilions, basketball courts, ball fields, a covered picnic area, large playground, and sand volleyball courts make a fully rounded facility. Lots of open space for running with the kids. Plenty of parking in three large lots. This dog-friendly, community park favorite has approximately 3 miles of walking trails along a creek and through wooded areas with benches for resting along the way. The park itself covers 77 acres and includes two playground spots for kids and lots of equipment for climbing. Also available are two regulation bocce courts, a fishing pier and numerous game tables for chess, checkers or other table games. Lots of parking available. 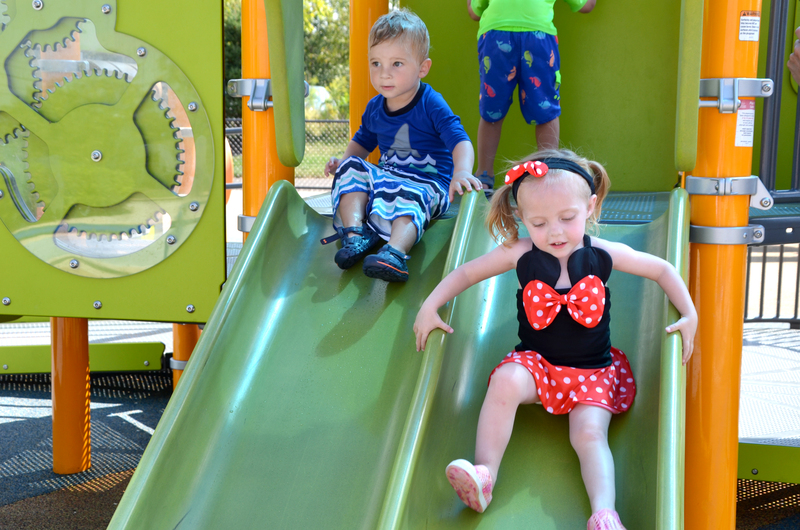 Located right outside the Community & Recreation Center, this inclusive playground and spray park has a lot of fun special features that make it a great spot children of all abilities. The well-designed space features shaded play areas, tables, benches and two outdoor bathrooms. All of this, plus the absence of mulch or wood chips, makes this a stress-free spot to bring the little ones. The playground space includes slides, swings (a variety of types, including ADA), climbing areas, see saws, and more. The Spray Park operates daily from 11 a.m. to 7 p.m. from Memorial Day through Labor Day. Although this park is only open to Abington Township residents, guests are welcome. So a grab a friend to enjoy a full day among all the offerings. A playground, basketball courts and walking trail are open year-round as are the tennis courts and Par 3 Golf (fees apply). During the summer enjoy the mini-golf park, the wading pool (for kids under 5) and fishing in the pond (tag required). This park has something for everyone within its 76 acres. Visitors can enjoy lighted volleyball, basketball and tennis courts, as well as the increasingly popular pickleball courts and ball fields. The playground features 3 climbing units, dinosaurs and a water spray pole. A walking trail with 18 fitness stations (.72 mi. ), restrooms, Woody’s Fishin’ Hole pond with fountain, an archery range (permit required), horseshoes, picnic tables and pavilions round out the amenities. Kids will love the Safety Town big-wheel riding complex featuring buildings, roads and working traffic lights. The town’s lights operate daily from 10 a.m. to 2 p.m. during the free non-group use periods. Riders must bring their own big-wheels or tricycles. The town is also available for rent when the park provides trikes as part of the rental package. Visit the park website for rental info. Kohler is another Horsham township park that offers a scenic view while enjoying a walk or playing outdoors. The asphalt walking trail traverses through woods and fields and two large fishing ponds have aerating display fountains. Playground apparatus, a dog park and two horseshoe pits for your next outdoor barbecue in the park. Also known as Everybody’s Playground, this play spot has lots of bridges, climbing ramps, and places for kids to run, jump and swing. Colorful soft padding under foot and large canopy umbrellas overhead throughout the area are nice touches. Everyone will love to rock the boat on the Sway Fun activity. Enjoy the tranquility of this park in the woods. A playground for the kids, picnic tables, restroom facilities and meadows for running make this a great spot for a picnic lunch with the kids. Bring a stroller or bikes and ride/walk the adjacent Perkiomen Trail as it winds its way through woodlands and over the Perkiomen Creek for some great scenic views. Pottstown’s community park that features lots of great activities for sport enthusiasts. The park is home to the Trilogy Park BMX race track, a USA BMX affiliated track in Eastern PA. Practice days and races run throughout the year and it is also open for general riding. Also located in the park is the Fountain of Youth Spray Park located off Manatawny Street. It is free and open to the public from 10 am to 7 pm between Memorial Day and Labor Day. No staff on duty so visitors use at their own risk. Changing stations are available in the restrooms.